Seven Fathead wall clings are now for sale to help The American Legion celebrate its centennial and share its story in local communities. The clings, which adhere to wall surfaces without damaging them when they are moved and reused, range from a 120-by-48-inch display of the Four Pillars of American Legion service, to new and vintage constitutional preambles and logos in a variety of sizes. 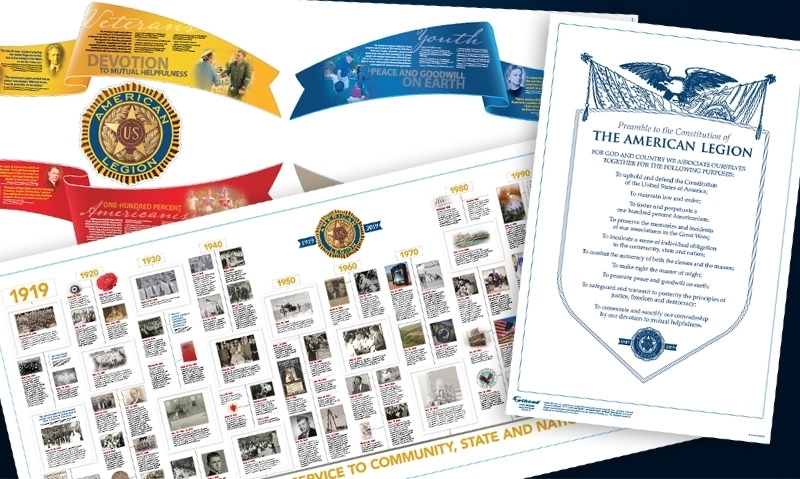 Also among the wall hangings is a 78-by-31-inch decade-by-decade timeline, and a single 19-by-48-inch display that celebrates 100 years of service to community, state and nation. Past National Commander Dave Rehbein, chairman of the Legion's national 100th Anniversary Observance Committee, stated that "the history of our organization - all 100 years of it - has illuminated and inspired me, and I am sure it will do the same to our Legionnaires, Legion Family members and the general public as well, however and wherever a post decides to utilize the Fatheads." The items come in a variety of prices and can be ordered through American Legion Emblem Sales by visiting https://emblem.legion.org and searching for "Fathead," or calling (888) 453-4466. Each of the wall clings can be viewed in detail online. The clings are made upon order and take four weeks to produce, so Emblem Sales staff advise ordering them by Feb. 8 to be sure they arrive at a post in time to be put up for the Legion's birthday, March 15-17. Additional centennial products can be ordered online under the 100-Year Anniversary category, or by calling (888) 453-4466.